Today's recipe is brought to you in part by the letter A! Just kidding. It's actually a recipe created by Justin Warner, Season 8 Winner of Food Network's The Next Food Network Star...fancy! Ironically this Asian-American fusion appetizer was created to pair with a Robert Mondavi Sauvignon Blanc...so maybe Asian-American-French fusion? This appetizer/party snack not only pairs well with this white wine, it's actually infused into the recipe via the sauce! Now THAT's fancy. Let me just put this out there. 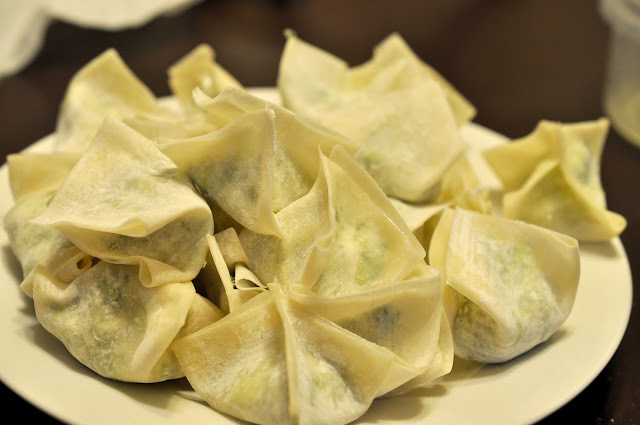 Wontons are our friends. Whether in soup, stuffed with meat or oozing with cream cheese, these hands free little pockets of goodness are one of nature's perfect foods. 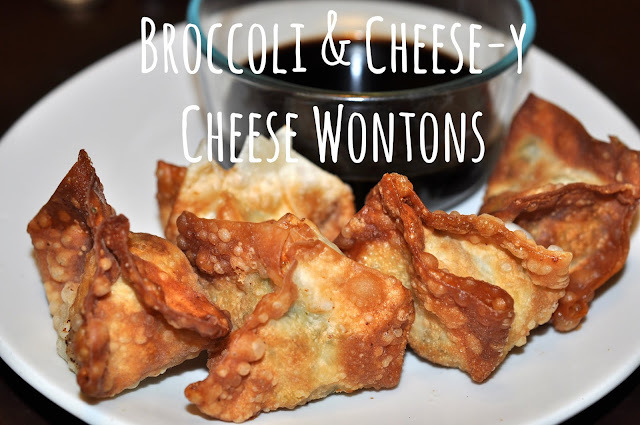 Keeping that in mind, if you're maybe in the mood for a more healthy option you can always stuff these little wrappers with greens, case in point these Broccoli & Cheese-y Cheese Wontons. No, there's no mistake in the name of these wontons, they are literally that cheese-y cheese...y. Goat cheese and cream cheese mixed with broccoli, parsley, shallot and salt. Cheese on cheese on greens. These wontons might take you back to your childhood days of broccoli and cheese at dinner but I promise you this is much better. There's no correct way to fold a wonton, well at least I don't know the correct way but in the words of the chef himself, "Get creative. As long as they're sealed you're good to go." I tend to pull all the corners up to the top and fold the sides to create a kind of dumpling shape. They don't have to be perfect! Promise! Once all your wontons are stuffed and folded it's time to make the sauce! We're cooking with wine so don't freak out, it'll be okay. 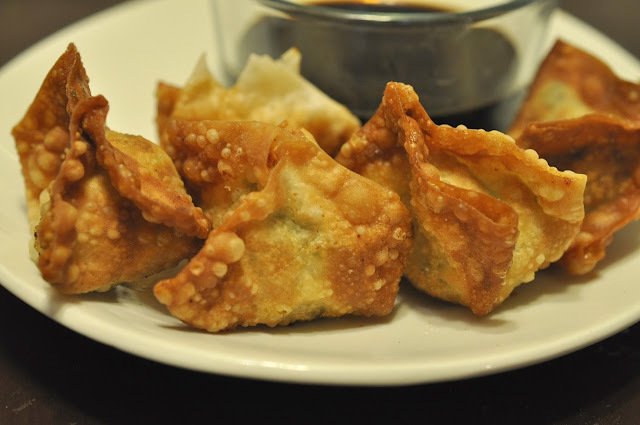 You're just boiling some soy sauce with some wine then adding some sugar to create a dipping sauce as unique and fun as your wontons! The Stuffing: Moisten some paper towels and wrap the broccoli with them. Put the moistened broccoli parcel on a microwave-safe plate and microwave for 2 minutes on high power. 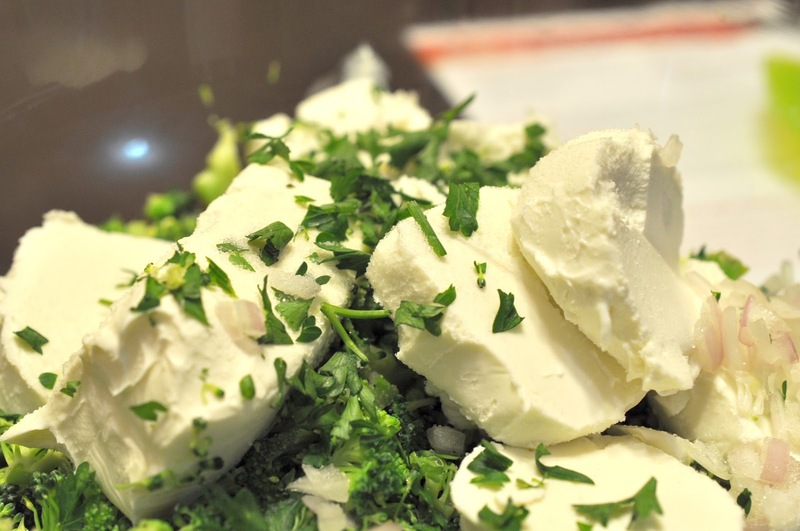 Carefully place the florets in a mixing bowl with the cheeses, shallots, parsley and kosher salt. Using a wooden spoon, a fork or a rubber spatula, mix the ingredients until thoroughly combined. The Preparation: Put heaping teaspoons of the mixture in the center of the wonton skins. Brush some of the egg white on the edges of the wrapper and seal. Continue until you run out of filling. Place these guys in the fridge while you make the sauce. Preheat the oil in a Dutch oven to 350 degrees. The Dipping Sauce: Put the soy sauce and the Sauvignon Blanc in a saucepan and slowly bring to a boil. Remove from the heat and stir in the sugar. Refrigerate until you're ready to use it. To Fry: Fry the wontons in the 350 degree oil, in batches of 3, or until they are golden brown. 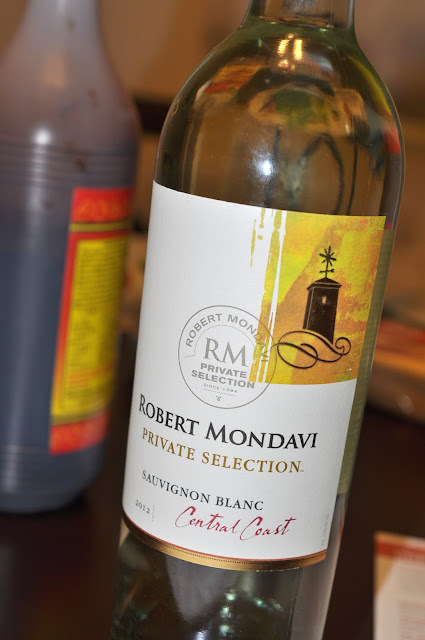 Drain on paper towels and serve hot, with the sauce and a cold glass of Robert Mondavi Private Selection Sauvignon Blanc. I love broccoli cheese anything - can't say that I have seen it in a wonton. :) Can't wait to try these!